Next week will be the last week of schooling days marking another year has passed. Thus, I am starting to make some thank you cards for my daughter's teachers as their efforts for being a teacher are really truly appreciated by me at least. Here the take for my first card! I adopt the sketch from Deconstructed Sketch No. 177 as shown above and rotate it clockwise. A green background with white dots pattern paper is trimmed into the desired size. Then, it is tied with a pink-white twine as in the sketch. Once the ends has been secured, it is attached onto a pink card base. 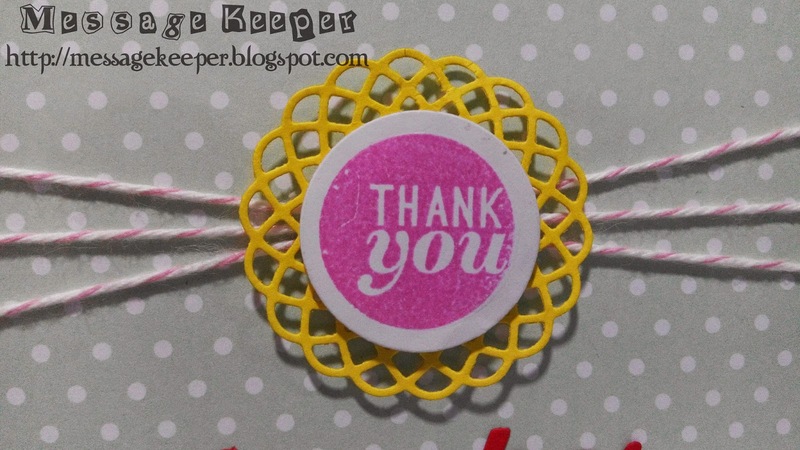 A mini doily is die cut using yellow card stock and attached to the center of the card where the twine crossed each other using pop dots. The sentiment is stamped onto a white circle and attached onto the yellow doily using pop dots as well. Finally, the word 'teacher' is die cut using red card stock and attached at the bottom of the doily. I'm sure your daughters teacher will love this. It's a fantastic card! Thanks for joining us for DS177. A lovely, colourful, way to express your thanks to your daughter's teacher(s). Thanks for joining in the fun at Just Add Ink this week! A lovely message and card to give your daughters teacher. The triple twine tied into the medallion looks great. Thanks for joining us at Just Add Ink this week.